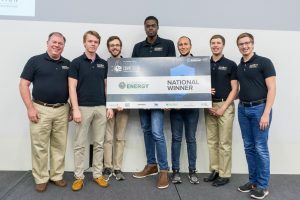 The University of Central Florida’s Collegiate Cyber Defense Team won the U.S. Department of Energy’s CyberForce National Competition that challenges teams across the country to build a robust corporate network that can withstand attacks to steal data, deface websites or wipe out critical systems. The competition drew bids from 97 schools seeking to participate and UCF was one of 66 teams selected to compete Saturday at DOE’s national laboratories. UCF’s team competed in Argonne, Illinois. Participating teams spent several weeks designing and building corporate networks that, during the competition, were challenged by professional hackers. UCF’s networks, which included industrial control systems for a fictitious oil transportation company, a power delivery company, and a high-performance computing cluster, were found to be the least susceptible to the attacks. UCF’s team is comprised of six College of Engineering and Computer Science students and their coach, Dr. Tom Nedorost, associate instructor of computer science. Pictured: Team Coach Dr. Tom Nedorost; Team Captain Austin Sturm, master’s student, digital forensics; and senior undergraduates Andrew Hughes (computer science); Matthew St. Hubin (information technology); David Maria (computer engineering); Michael Roberts (information technology); Martin Roberts (information technology).